I did an easel card for a girl this time. She is a sweetie....cute and fashionably sassy. I thought that this TGF (The Greeting Farm) image called 'Cheeky Rockabilly' suited her perfectly. I found just the right printed paper from the DCWV It's All About Girls paper stack pack. The scalloped glittered oval was punched (Marvy) from DCWV glitter cardstock. 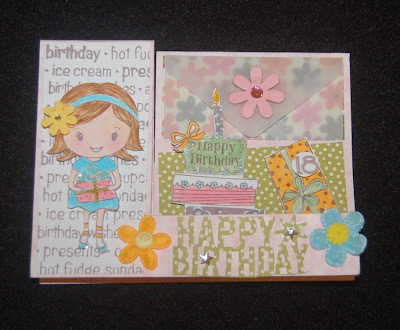 I used the Spellbinders 'Circles' embossing plate to make the design on the light pink paper. 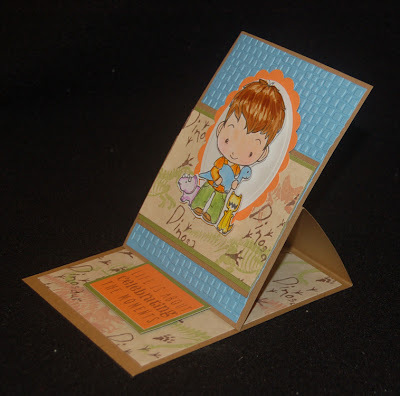 Although it's hard to see the embossed 'Happy Birthday' cartouche-like label (holding the easel up), it has a retro feel because it was made using a Sizzix imrpession folder on a blue white core cardstock and then sanded to reveal the white. I think it matches well with the paper and the overall look of the card. Slowly, I am learning that one of the important aspects of card designing is picking the right papers and finding embellishments that match in both color and style. If you continue to observe other paper artist's work on their blogs or in magazines, you will constantly learn not only what is trendy but the little tricks which will make your work stand out. Keep learning every day! of any that I finish. Although I didn't particularly like how this project turned out (the patterns are a bit too busy so the embellishments don't show well), but I thought that you might like to see how easily the Sierra Pacific items can be decorated. 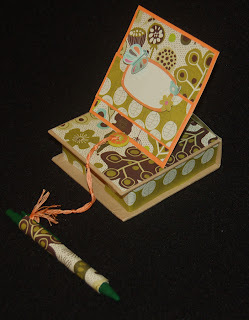 I used K.and Co. paper (Carolyn Gavin 8.5x8.5 double sided paper pack). 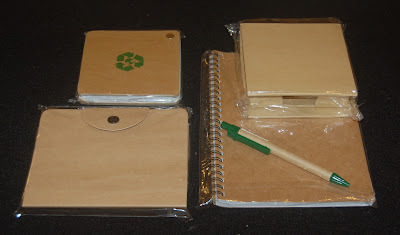 Only two sheets were needed for both the note paper box and pen. I basically fit the paper to the box by tracing and testing. By leaving the brown cardboard showing along the edges there was no need to struggle to wrap the paper around the edges. I used Merikan double sided tape to stick the paper down. 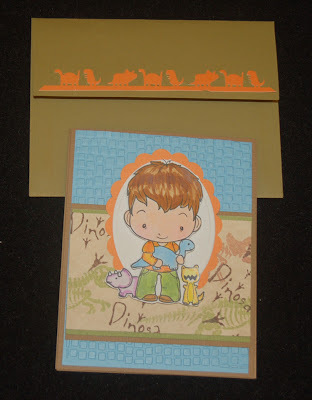 The embellishments were from K. and Co. too (the 284 piece package of die cut cardstock). If you can't find the pack of die cuts you can easily cut out and glitter some of the designs from the 8.5x8.5 cardstock. I think next time I try to attach a pen I might use thin ribbon because the embroidery floss doesn't look quite right. The button that holds up the easel is from the new Blumenthal buttons sold at Ben Franklin Crafts. The reason I made an easel format is so that reminder notes can be paper clipped to it and yet the easel can be folded down for gift giving. I didn't fill in the bubble yet because I haven't decided what sentiment or whose name to put on it. Anyway, this is just a sample and I'm sure you can come up with some better way to decorate these low-cost craft items. 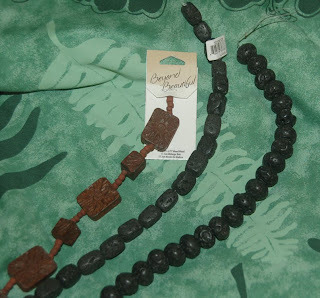 I bought these lava-like and wooden carved beads (Beyond Beautiful) from the Ben Franklin Crafts bead department. Initially I thought that I would make a man's neck piece, but I couldn't find the carved piece I had saved for the project. (I guess its time to clean out the bead bins.) Anyway, while digging and sorting I came upon this gorgeous shell and wood inlaid teardrop pendant (Imagine It). 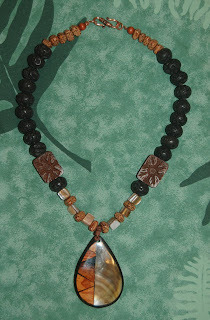 After finding some smaller shell and wood beads, it was a simple one hour job to a finished necklace. I like the resulting project so much I think I'll write up the instructions for the website and wear the necklace this weekend. 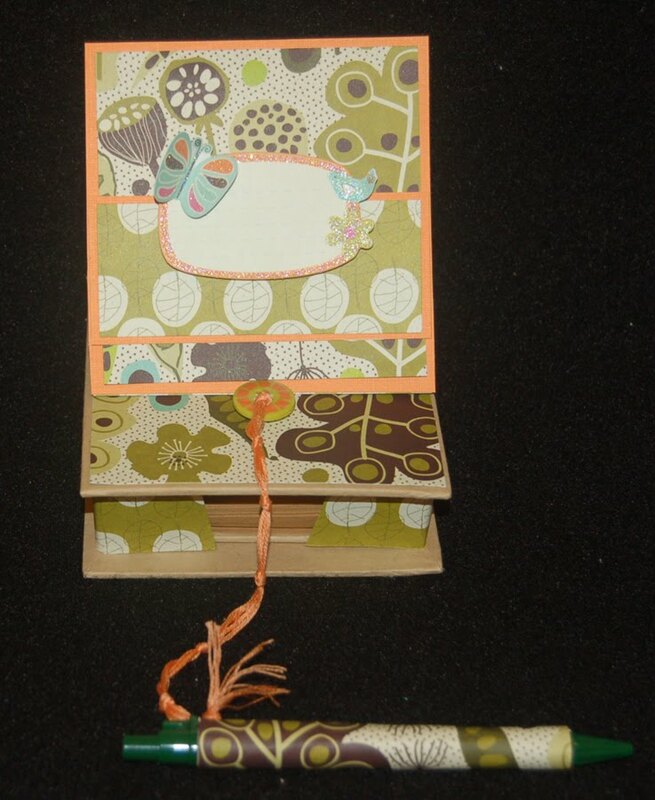 Go check out our craft club website (http://www.bfcraftclub.com/) to see the format changes and new craft ideas. I'll go back to hunting for that carved pendant for the man's neck piece. 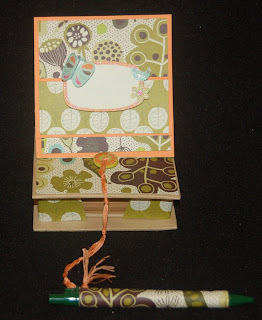 I've always admired easel cards that I've seen on other blogs and in magazines, but I've never tried one before. It's really easy to make. You start with an upright card blank with the fold on top. Then score and fold half way down the front. Cut another piece of cardstock the same size as the card front and attach it to the folded down front flap (the lower half). Use pop dots to attach a piece as a brace to hold the front of the card upright. This card looks like it is for a little boy but actually it is a birthday card for my grown up son who lives in San Jose. I started feeling nostalgic while viewing some old family videos. When did that little boy who loved dinosaurs grow up? As soon as I saw the TGF stamp set that had a little boy clutching a toy brontosaurus, I knew I had to buy it. The stuffed toy on the stamp looks exactly like the one I made for my son decades ago. He loved that brontosaurus who was named 'Bronty' after a character in a children's book. I hope when he receives this card it will bring back happy memories. I get misty-eyed just thinking about those sweet, innocent days of my son's childhood. You won't find the printed paper I used because I had to stamp my own using a Basic Grey clear stamp set. I just couldn't find the right design or color even though I have stacks and stacks of paper. I also made the blue paper (embossed with alligator-like impressions) by sandwiching it in a Cuttlebug embossing folder (so quick and easy). After displaying this easel card for awhile, I hope that my son puts it in the album of cards and mini-scrapbook pages that I gave him. He better not toss it aside or HORRORS......throw it away! I may have to disown him if he does. LOL! I felt so bad about missing my niece's birthday that I had to make her an extra special handmade one. I know that this card seems inappropriate for an eighteen year old, but my niece has a very colorful personality which is why I designed this card for her. It has the same format as the thank you one I made for my sister. (I just learned that Joy, host of the Joy of Crafting show (OC 16 Sundays at 6:30PM), will be showing a similar card format on a future TV episode so now I don't have to draw a diagram which is so tedious to do.) This one has a vellum envelope attached to hold birthday money. 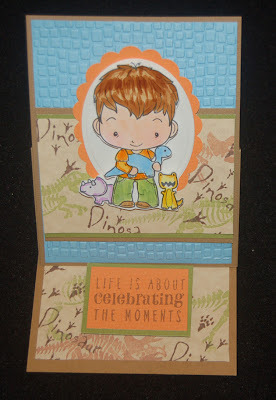 All the stamps used on this card are Hero Arts ones (birthday gift, girl with a gift, and special day words). The cute puffy flowers are Darice products and the others are FloraDoodles. 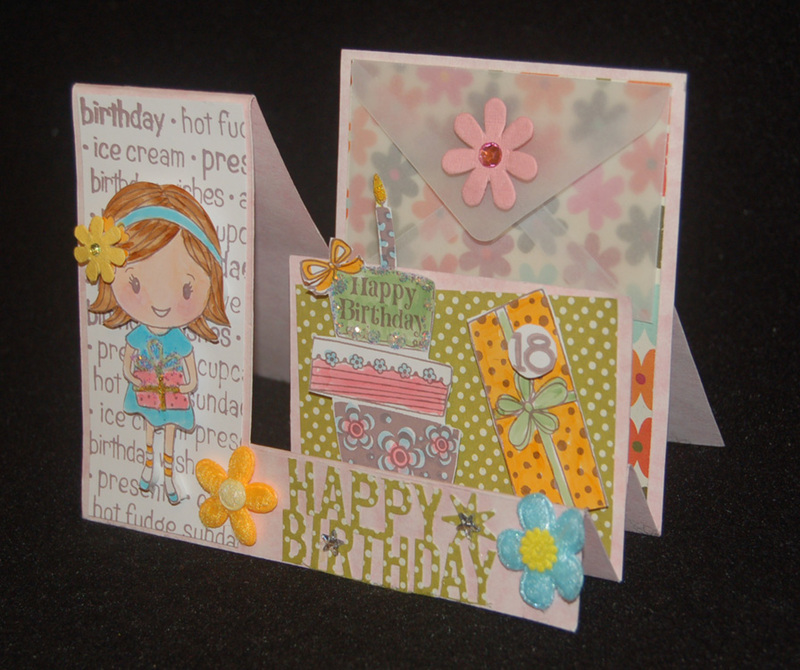 The Happy Birthday words on the bottom of the card are punched out using the Martha Stewart punch. Sorry, to be so late in remembering your birthday, Dawn. Thank you to all who stopped by to read this post today. I hope you found it informative and that it encourages you to visit again in the near future. Many of you seem to be interested in what goes into my shopping basket and why. As you can see I buy a lot of rubber stamps. I am especially fond of the clear stamps because they store flat using a minimum of craftroom space. Also the clear stamps allow me to position the image exactly where I desire because they attached and re-attached to clear acrylic blocks. 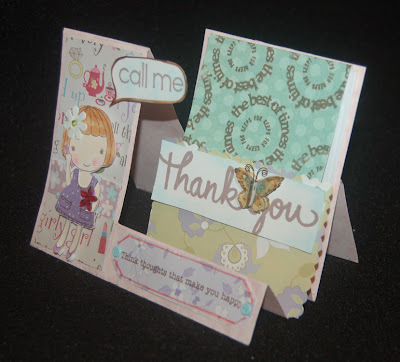 You only need a few acrylic blocks of assorted sizes to use with all your clear stamps. The cling stamps are good too because they are also space savers and can be attached to the acrylic blocks but the cost is lower. In this photo is a new pack of DCWV called, 'It's All About Girls'. 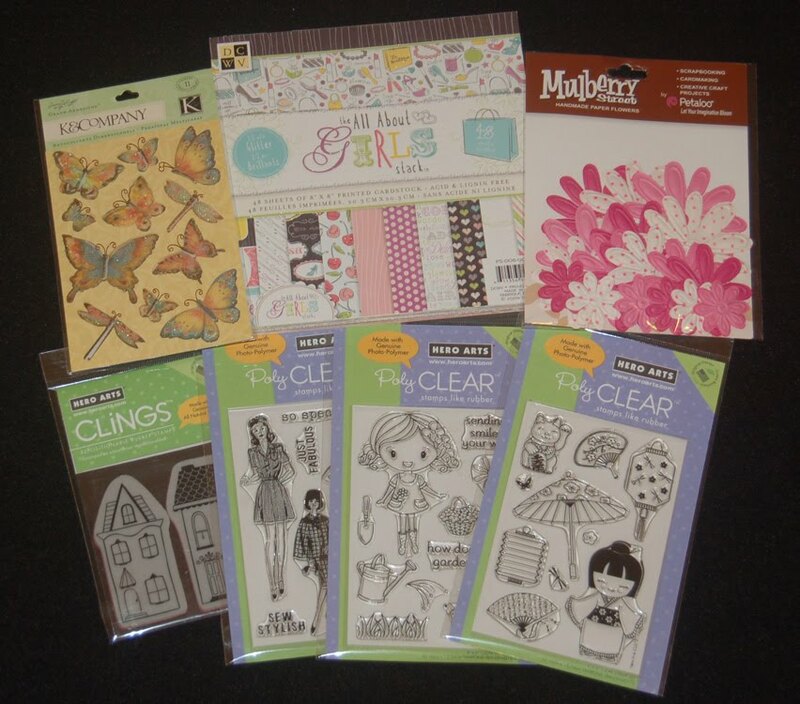 The paper pack has lots of pretty girly girl sheets (some with glitter). This paper pack size is just right for card makers because although the 12x12 sheets are more economical per square inch, it takes a while to cut down the sheets to card size and there seems to be more waste. I think that it may come in larger sizes but I only found this one pack. I do know that there were also 'It's All About Boys' paper packs because I bought one awhile ago (so this girl version may not be 'new' except to me). 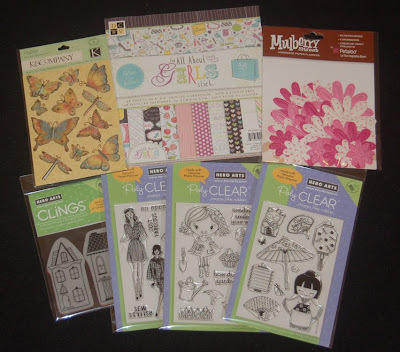 The butterfly stickers are the ones I talked about in my last post and flowers I bought because they are pink and have dots so I know they will match many of my projects. Well, that was all I put in my shopping basket today but I did just go to Ben Franklin Crafts the day before. LOL! While shopping in Honolulu with my sister and two friends, I saw a simple, sweet necklace. I didn't buy it because of the price and I knew that I could duplicate the look for less. Picture here (click on photo to enlarge) is the result of my knock-off attempt. 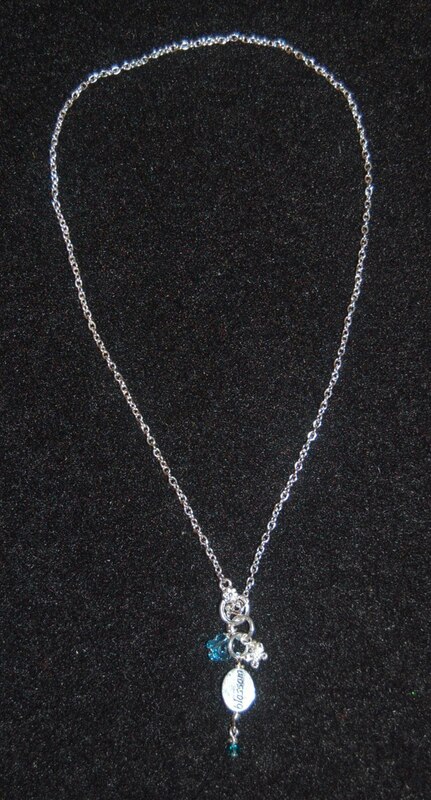 Although the necklace could be done in sterling like the original one in the store, I thought that at this cost conscience time silver plated jewelry is just fine. All the parts for this necklace can be purchased from Ben Franklin Crafts and the necklace can be assembled in less than an hour. I will put the supply list and instructions on our website as soon as I can. While it is not exactly like the necklace we saw while shopping, I hope that my friend, June, will try her hand at making this simple wire-wrapped jewelry that she admired...or if she prefers, I can wrap it for Christmas. Thanks for stopping to read this post. I appreciate your comments and readership. 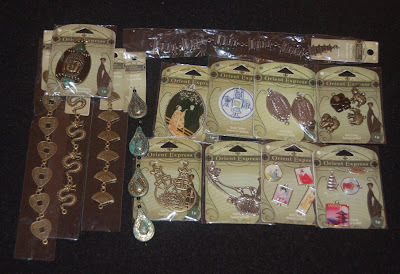 Have you seen the new Blue Moon line of jewelry components? I bought these from the Hilo Ben Franklin Crafts, but I know that our Mapunapuna store has them too. It is a fabulous assortment of Asian looking charms, chains, focal pieces, and more. I've been too busy to create something from this line but I will ...soon. As most of you jewelry makers know, the Blue Moon line is very reasonable. The local ladies will really love these pieces because they coordinate well with the Asian fashions so popular in the islands. When you check out this new jewelry line at the Mapunapuna Ben Franklin Crafts, be sure to check out the new layout of the store and the fancy hardwood floor in the bead department. I returned home from my trips to learn the sad news that one of my friends had passed away. She left so quickly. Although not one of my closest friends, she was a one of those people who had a beautiful soul which made people want to be near her. I wish that I had a chance to say goodbye and tell her how much I cherished her friendship. Hug a friend today! The photo is of a simple sympathy card that I made for her family. I kept the design pretty and soft like my friend. On the inside I used the simple phrase, 'With Deepest Sympathy', because especially with this death I understand the significance of the words. Being a mom with children of the same age group, I can only imagine the heartbreak of losing a wife and parent so unexpectedly. 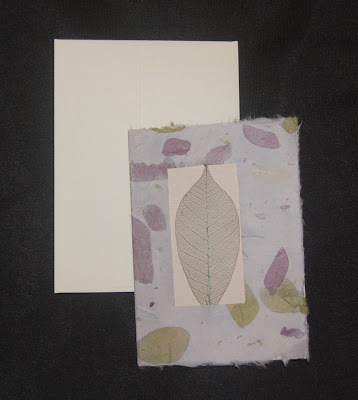 Crafting Tip: The lavender paper with the embeded leaves used for this card is quite fiberous so to achieve a deckle edge I placed the ruler where I wanted to tear and then wet along the ruler edge using water and a small paint brush. Holding the ruler down, it is a simple trick to rip exactly where you want to and yet acheive a natural deckled edge. A craft knife was used to cut the window. The skeleton leaf is available at Ben Franklin Crafts. I used a dotted This to That adhesive dispenser (three assorted dispensers to a pack). This dry adhesive tape won't wrinkle the delicate paper and adheres the leaf invisibly.